We’re still down on the farm this week. Last week we were doing the theological horticulture of seeds and soil. This week, in the parable Jesus tells, the planting has been done and the crop is growing. What a relief! The farmer can sleep at night with a peasant’s pleasant dreams of a harvest. Can’t he? Not so fast! As it turns out, no, he can’t. As if rocky soil, weeds, weather, and pests weren’t problem enough, there’s a people problem. The traditional name for this parable is the Wheat and the Tares. You could also call it the parable of the Feuding Farmers. Feuding families were a common outcrop on the social landscape of the world in which Jesus lived. Indeed you didn’t have to start a fight with your neighbours. Simply by being born you inherited from your parents and kinship group a ready-made set of friends and enemies. In American folklore we have the famous feud in Pike County, Kentucky during the second half of the nineteenth century between the clans of the Hatfields and the McCoys. It escalated into open warfare claiming over a dozen lives. We’ve got a situation like that in this parable, without the bloodshed. A feud (let’s say) between the Waites and the Wrenchworts. What happens? One night, while farmer Waite and his family are counting sheep, one of the Wrenchwort clan hops the fence, sneaks into his neighbour’s field, and sows some weed seeds. 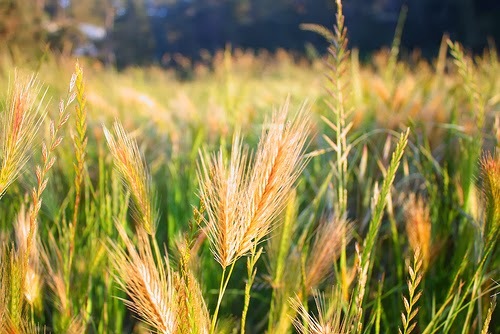 In fact, the vandal is particularly dastardly because the seed he sows – in the Greek, zizania – is a particular species of grass known as darnel. Darnel grows like wheat, and looks like wheat, but it’s poisonous – and that will put farmer Waite in a position between a rock and a hard place. Now it was usual agricultural practice to weed out darnel, perhaps several times a season, precisely because zizania is so toxic that it can easily destroy a crop – that’s the rock I mentioned. But then there’s the hard place: if there is a profusion of these weeds, their roots can become so intertwined with the roots of the wheat that neatly separating the two is well-nigh impossible, and certainly a very risky business. So what does farmer Waite do? “Leave it,” he says to his workers. “We’ll sort it at the harvest.” And there the parable ends. After telling another couple of parables – one about mustard seed and another about leaven – Jesus goes on to explain the parable to his disciples, but most scholars agree that this explanation is actually Matthew’s, not Jesus’ – Matthew is really into fiery furnaces and folk weeping, and wailing, and gnashing their teeth – so we’ll just stick with the original. In this scripture, what might the Spirit be saying to the church today, to us here and now? Well, the basic point isn’t rocket salad – I mean rocket science! It’s a parable about patience. I have preached many times on patience – most recently last Advent – and confessed that patience is a virtue with which I, personally, have constantly struggled. But I think we live in an age – the age of Information Technology – that particularly conspires against patience. In April I got a new PC. I was pretty happy with the old one until my kids, when visiting, wore me down complaining how s-s-slow (“Dad!”) the old one was. We live in a culture of speed where delivery has to be swift. But today, taking our cue from the parable, just what is the Spirit saying about patience? You see – to continue the PC metaphor – the church gets infected by all sorts of viruses from the culture in which we live. I want to suggest that impatience, though it sounds like a rather minor vice, is actually one of the worst of them, because it drives us to do not just stupid, but sometimes quite sub-Christian things. Indeed, as a church we do these stupid, sub-Christian things precisely to the people represented by the person on whom the parable turns: that lowlife Wrenchwort – the enemy. Jesus talked a lot about enemies. That’s because he made a lot of enemies. Powerful enemies who eventually killed him. The first Christians, indeed the early church for three hundred years, also made a lot of enemies, suffered persecution at their hands, were fed to lions by them – the martyrs who refused to bow the knee to Caesar, refused to fight in Caesar’s wars. Then Caesar – one Emperor Constantine – himself became a Christian and everything changed. Ever since, apart from the historic peace churches like the Mennonites and the Quakers, we have done Caesar’s bidding and spread Caesar’s carnage. When the state says, “Kill!”, we kill, even other Christians. That’s because we take the Sermon on the Mount as if Jesus preached it for us to break into groups and discuss it instead of to obey it. Indeed the church has deployed our parable itself to justify compromises with state power, arguing that good and evil – the wheat and the tares – are far too mixed together for us to be decisive witnesses to the radical nonviolence of Jesus. We must be – the weasel-word – “prudent”. But Jesus was anything but prudent. Nor does his parable teach prudence. Jesus knew evil when he saw it, and he named it, he spoke truth to power – that’s why he made enemies – and so does his parable. Wrenchwort is a villain. Evil is not obscure: if someone or some system does violence to people by excluding them, or impoverishing them, or, finally, by killing them – that is evil and followers of Jesus can have no truck with it. Prudence is not a Christian virtue. Patience, on the other hand, patience is an altogether different matter. With evil, followers of Jesus must be patient as Jesus himself was patient, even with Judas, as God himself is patient, even with the devil himself. Jesus never excluded Judas, even sharing the last supper with him. And surely you must have wondered why God has given the devil his leash, why he’s never reeled him in, why, indeed, he’s never destroyed him. But surely the answer is obvious: because Jesus and the Father of Jesus don’t do violence – don’t do either pre-emptive strikes, or “payback” – no, because they are patient. You know why people are impatient? Because we need to be in control, to feel that we are in charge. Not being in a hurry, knowing how to wait: that takes trust in the providence of God, faith that God is in control of events. The early church had that faith. That’s how it could resist Caesar. But then slowly but surely, with Constantine, with Christendom, and finally with the rise of the modern state, the church lost that faith, or rather repositioned that faith in kings, parliaments, and presidents, who now, self-evidently, controlled the course of history. Being loyal subjects or citizens trumps being obedient disciples. And still we do pretty much what the state tells us to do – the state which (as Alastair Campbell bluntly but brilliantly put it) doesn’t “do God” – because belonging to Britain or America is evidently more compelling than belonging to Christ and his church. And the connection with patience and impatience? Isn’t violence the sin par excellence of not taking time, of being in a hurry, of the rush of blood and the angry outburst in personal relationships; of speed of delivery, of doing it to them before they do it to you, of war-war rather than jaw-jaw in international relations? Did you ever notice that Jesus doesn’t do velocity, that even when he does hurry-up he makes haste slowly, deliberately? And, of course, in his passion, he gives himself up, hands himself over, relinquishes all control to the powers of evil. Why? Because he knows that Pilate is just a pawn, and his Father has things well in hand. And because, as he says, “All who take the sword will perish by the sword” (Matthew 26:52). Speed, violence, and impatience on the one hand; slowness, peace, and patience on the other. Do you see the connection? And the conclusion I draw is this. Within the church we must accept that we are all sorts, and be inclusive of those who, personally, get on our nerves and, theologically, interpret the faith differently from the way we do. So no stomping off in a huff, or excluding those to the left of you or those to the right of you! And in the way the church interfaces with the world, a distinct identity with the courage of its convictions, including the refusal to deploy violence either against the state or on behalf of it. In the church and in the world, “all false zeal must be checked, the field must be left to ripen in patience, … and everything else left to God in faith, until his hour comes” (Joachim Jeremias).